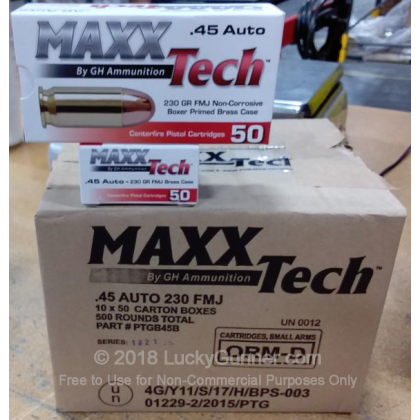 This 45 ACP cartridge is made by MAXX Tech, a brand which specializes in giving shooting enthusiasts extremely budget-friendly means of enjoying their favorite hobby. The round’s 230 grain projectile is the most popular for its caliber, so you’ll already be familiar with how it’s going to perform during your next trip to the range. The bullet dons a hard metal jacket to let it feed smoothly from magazine to chamber, and will prevent lead residue from quickly souring your aim over the course of an extended target practice session. Although cost-effective, this round still offers a casing made of brass and non-corrosive Boxer primer as well. MAXX Tech ammunition is manufactured by Pobjeda Technology in Višegradska , Bosnia and Herzegovina. The company has been in the ammunition business for the better part of seven decades, and has researched the technology and built up the high output facility needed to mass produce such affordable cartridges. We don't have any reviews yet for this particular .45 ACP (Auto) ammo from MaxxTech. If you'd like to be the first to review this particular .45 ACP (Auto) ammo from MaxxTech, fill out the form below. We also have this 45 ACP - 230 Grain FMJ - MAXX Tech - 50 Rounds ammo in stock in a smaller quantity.